ctrlio began like most great startups - with a very simple “What if?”. What if instead of big data powering sales for corporations, it gave consumers the power to choose the right plans for them? A simple question grew. It really grew! In a mere six months since they’ve launched they’ve identified £1.5 million in savings for mobile users and they’re still growing fast! In the first quarter of 2016, £1 million has been found. It’s a massive market they’re jumping into with a total of £6.2 billion available in savings if the entire UK switches to the right mobile plan for them. They’ve got 560,000 plans on 12 networks to match users to, so everyone can be sure they’ve got the perfect plan for them! On the tail end of this ctrlio has proved that automatic scanning of bills can result in 11.5% greater savings compared to manually entering the information! To aid in this, they’ve introduced the Fair Data Index. A scoring system means that you can tell which operators have made a mission of making data access for their customers a priority. 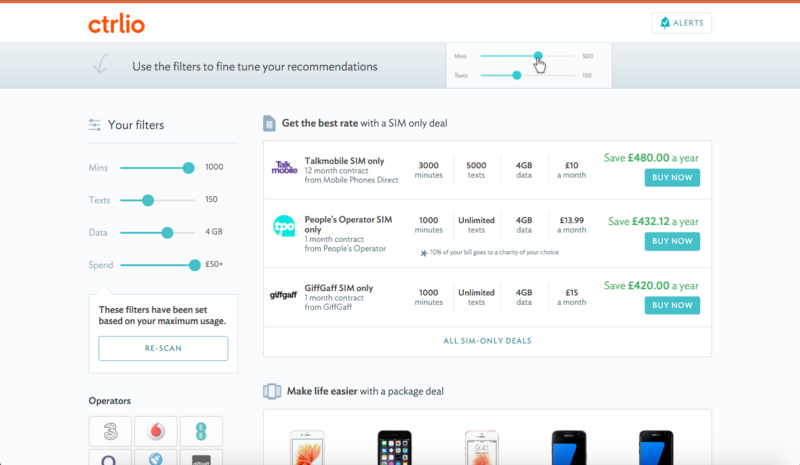 Giffgaff is currently leading up the ranking! What’s next for ctrlio? They’ll be using the same underlying technology to bring their savings to household costs like energy and insurance! Vote for our awesome members, Fabrik, who are nominated for a Webby!